I know it has been forever and a day since I last posted, but I have not disappeared and Paleoaerie is not going away. I have been busy and pondering a reorganization for the website. One of the things that has kept me busy is a series of talks that I have given and, most importantly, am about to give. Mid-America Science Museum has asked me to be the guest speaker for their dinosaur exhibit over the summer. I will be giving one set this Saturday, July 23 and again on Saturday, September 3. It is my plan to put all these talks online. But one thing I have learned this summer is that I am truly horrible at making a video that requires me to actually talk in it. So I am trying to figure out a way to get over that problem and bring my talks to you. In the meantime, here is a short description of the talks. New Discoveries in Paleontology: This talk will focus on, as the name suggests, new discoveries in paleontology. I will be discussing new dinosaurs that have been found this year, but the majority of the talk is discussing how paleontology has gone high tech and what we have found with these new techniques. Tyrannosaurs vs. Spinosaurs: A question that gets asked of all palentologists since Jurassic Park III came out is who would win in a fight between T. rex and Spinosaurus. So this talk discusses the new science on tyrannosaurs and comparing them with what we know of spinosaurs. Mesozoic Arkansas: This talk covers what Arkansas was like during the Mesozoic, including all the different fossils that have been found in the area. 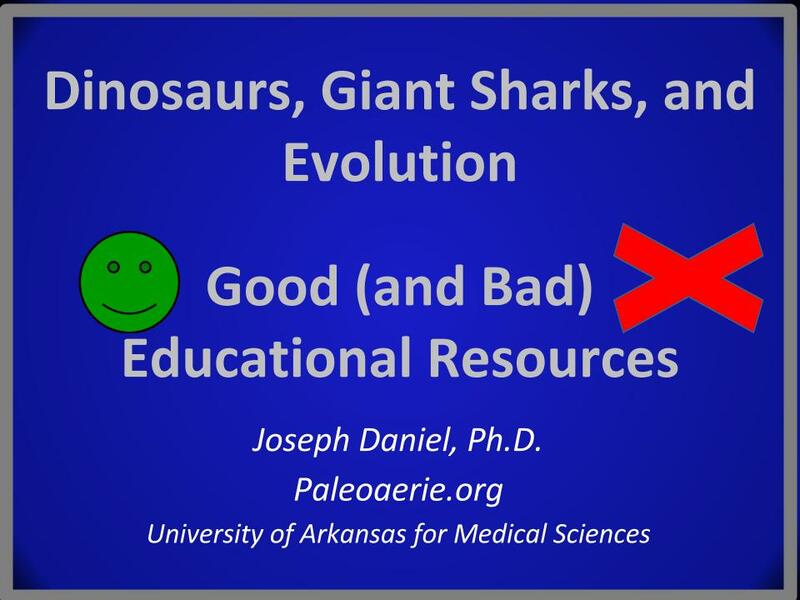 Dinosaurs, Giant Sharks, and Evolution: Selected Good (and Bad) Educational References: This is a talk I gave in April at AAIMS, the Arkansas Association of Instructional Media Specialists. I cover good books, websites, and shows on these topics, as well as a few to avoid. 500 Million Years of Natural History: Arkansas’s Secret Treasures: Here I give a brief rundown on all the fossils of Arkansas, starting from the Cambrian all the way up to the Ice Ages in the Pleistocene. If you have a particular talk you want to see, let me know and I will concentrate on getting that one as soon as I can. If you can make it to Hot Springs, AR this Saturday or in September, stop by the Mid-America Museum and hear these talks in person.